This week has been about all things kaizen. I have to come clean and admit I wrote this entire series last weekend as I was preparing to take off on vacation with my family. Thanks to the greatness of WordPress I was able to delay the submission of the posts. Yeah, I know… it’s a little mass production-ish… but hey what can I say. In any event, we are wrapping things up this evening. We have covered lots of ground and if you have just joined us please check out the following posts. Rule 9: Seek the wisdom of ten people rather than the knowledge of one. Lone Rangers are a thing of the past. No matter how brilliant you are, I assure you that listening to others, and I mean really listening, will accelerate your kaizen efforts ten fold. Rule 10: Remember that opportunities for kaizen are infinite. So far we have discussed 9 rules to kaizen. If you remember only one of them I hope it is this last one – kaizen is a mindset and never ends. 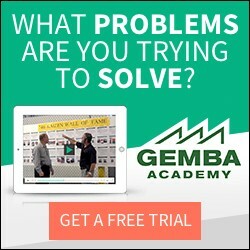 For those familiar with the book, “Gemba Kaizen” by Masaaki Imai you may notice an interesting relationship between these ten rules and the ten rules he shares. Yeah, they are the same rules but with my comments added. So, if you haven’t read this book I really recommend you pick it up and give it a good read. Thanks for the excellent info. I am new to Lean and really learned a lot. Please keep it coming! Thanks Ted. I will do my very best!